"Menon, as always, champions teens by allowing them the space and pace to make decisions, succeed or fail, learn, and blossom. This companion book to her successful debut, When Dimple Met Rishi (2017), hits all the right notes and delivers a joyful relationship that discards society’s dictates about appearance in favor of loving the whole person. Give this to readers who love a good rom-com with a message." 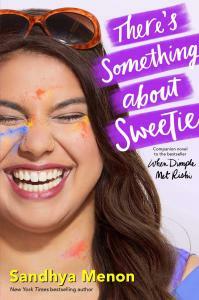 "This sugary romance will certainly be a taste call, but for those readers who can’t get enough syrup on their gulab jamun, it’s an unapologetic, wish-fulfilling dessert buffet...Swoon-prone readers will wish the Patel boys came in six-packs."